In our younger years eating healthy may not have been our top priority. As we get older the nutritional benefits of balanced diet are much more important. As the old saying goes “you get better with age”, so must your diet. This is especially true for patient receiving home care services. The great part is in Southern California and more specifically Los Angeles, there are a plethora of farmers markets, organic food vendors, and resources that can help on your journey for a nutritional diet. Also be sure to consult your doctor on any dietary changes to be sure it does not conflict with his care plan. There is no mystery that eating healthy if you are sick is very important. 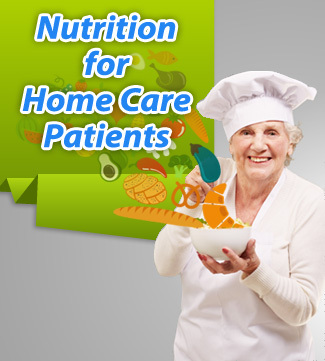 This is increasingly true for home care patients because many chronic illnesses can be helped by a good diet. Take cancer for instance. There are a number of foods that can help with many of the treatments you will receive such as selenium value of eggs can help with the side effects associated with chemotherapy. A study in Gynecologic Oncology showed selenium rich foods and supplements had high antioxidant values and resulted in higher white blood cell counts in woman with ovarian cancer. The women also showed reduced vomiting, nausea, abdominal pain, hair loss, and many other benefits. Keep in mind eggs do have a good amount of cholesterol in them. It is recommended to not have more then four in a week. As with any good diet “everything in moderation” goes a long way. Just because it is a healthy food does not mean you can eat as much as you want of it. The USDA Food Patterns, suggests that the proper calorie consumption for women above 50 starts at 1600 calories and can range as high as 2200 calories for very active women. For a man these numbers range from 2200 calories to 2800 calories. Below you will find the break down for men and women over 50 at different activity levels. It is also good to be sure to put in at least two and a half hours of exercise a week. Check out our post on 7 exercises for an ageing body for some great low resistance workouts. As with many home care patients, be sure to check with your doctor about proper activity levels for your condition. Portion control is hard for all of us, the saying “my eyes where bigger then my stomach” did come somewhere. So to make it easy below are few ways to associate portion size with everyday objects. To have a well balanced diet your meals should consist of a diverse set of food groups. Eating all proteins, which is popular on some diets, is usually not the healthiest diet. To make it easy think of making your plate colorful. Eating different vegetables and fruits as well as whole grains can go a long way in making you healthier. Also be sure to stay away from empty calories. Colorize your plate: eating different colors and types of vegetables and fruits. Eating the right grains: Be sure half your grains are whole grains. Keep the fat away: Eat only small amounts of solid fats and foods with added sugars. Limit your saturated and trans fats. Mix up your protein: Try to eat seafood at least twice a week and reduce the amount of red meats. This article was posted in Home Health Care and tagged Home Care, Home Health, Los Angeles.